Home > District Highlights > SOMS Upstander of the Week is Natalie B.! SOMS Upstander of the Week is Natalie B.! 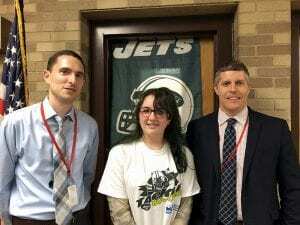 In addition to school-wide recognition over the public announcement system, Natalie received a Jets Tackle Bullying t-shirt and three tickets and a parking pass for the December 15 Jets vs. Texans game. Congratulations, Natalie!